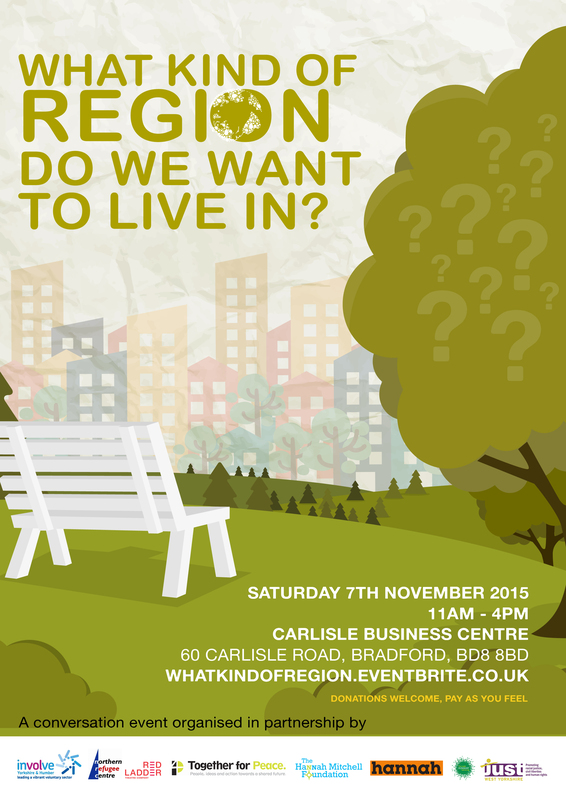 Will the future of our region be about all of us? Thirty people from Bradford, Huddersfield, Halifax and Leeds got together at the Carlisle Business Centre in Manningham on Saturday 7th November to share ideas about the future of our region. The event, called ‘What Kind of Region Do We Want To Live In?’ was hosted by Leila Taleb of JUST West Yorkshire in partnership with other members of the Same Skies Collective, a non-party political group from West Yorkshire working for a hopeful, fair and inclusive regional democracy. Leila was also joined by a special guest host in an independent role, local TV and radio presenter Peg Alexander. The Collective had been concerned that discussion about the future of our region had been dominated by people who already power nationally and locally and that the government’s ‘devolution’ agenda offered little of the hope for meaningful change and democratic renewal that Scotland’s own experience of devolution had inspired. Given this, Carlisle Business Centre in Manningham was chosen as the venue in order to make a strong statement that people from everywhere in West Yorkshire, and from all backgrounds, should be at the heart of any discussion about the future of the region. During the event, people took part in a range of sessions designed with advice from Ed Carlisle of community-building organisation Together for Peace so that all thirty participants had a fair chance to listen, talk and contribute. It was very clear from discussions that many people felt strongly that decisions affecting people here should be made by people based here and committed to here. Specifically those decisions should be made by people with an elected mandate that was based on democratic renewal that actively engaged all parts of our communities. Regional Democracy gave us an opportunity to think again and do democracy differently from a political system that has failed so many people across West Yorkshire for such a long time. Despite much concern about the nature of the government’s ‘Northern Powerhouse’ agenda, there was little appetite for remaining with the status quo and so participants generally felt that instead of simply opposing that agenda, there was a need to develop a positive alternative that emphasised democratic renewal and meaningful change. Nobody else is going to do it for us so if we want to make regional democracy work for all parts of our communities, we need to engage and think hopefully. Whilst this event included a range of women and men of different ages and from different backgrounds that made it more inclusive than most political events about the future of our region, there is still a long way to go in ensuring that all parts of our communities can play a full role. In particular there was a feeling at the event that whilst the government owned the ‘story’ of devolution, the content of policy hadn’t changed and so people didn’t believe that ‘devolution’ could make a positive difference to their lives. If people are to give any of their precious time to thinking about devolution, they must feel that devolution will allow this region the power to do things differently from the way that Westminster has always done them. – the need to address the unrepresentative nature of politics and to actively engage female, young, working class and BME voices. – the opportunities presented by our region’s diversity to ensure all parts of our community can contribute to our future, for example through community-led English language provision. – the opportunities presented by local public banking to invest in local business sustainably. – the need to ensure the development of our regional economy takes into account the impact on the health of all parts of our community. – the need to address the unfair choice young people face in having to move to London to get jobs. The Same Skies collective will be developing some of these hopeful ideas further over the winter, and a follow up event will take place in Leeds next Spring. If you would like to get involved in the next stage, please contact us via Twitter or Facebook. Regional Democracy: A Load of Osbornian Hot Air or the Chance for the North to Unlock its Potential? Can #RegionalDemocracy really make a difference to people’s everyday lives?